Left overs from version 4 of reality, think sandbox with lots of interesting Easter eggs for us to find and keep us amused ? Dinosaur bones left over from version 2 when the planet was 3/5th its current size, the 3rd iteration was the frozen world and now the 5th and last. Oh no, not the last! Aren't there some savegames around? I think you better re check those water marks. Conductive metal strategically placed in cavities not embeded within stone. I dont doubt your engineering credibility but in all honesty what do modern engineers educated with modern principles really understand about ancient engineering - Fact modern engineers with modern technology could not and cannot reproduce this structure. Respectively theres more doubt than certainty in your view. Water marks are vertical. Really lol have another look. Hmm. Saw a picture that seemed to show vertical watermarks. Now, in google the preview of that page shows clearly horizontal marks. But the text still says that those are from a low-quality limestone being washed out by light rain. AND another problem: that is not a sign of being underwater for a long time! That would look totally different - where are the sediments from currents? Where are marks of underwater fauna and flora populating the stones? Edit: Oh, and about what lapse of time are we talking? Continents are slow. Modern engineers have their skills and understanding of energy based on physics. 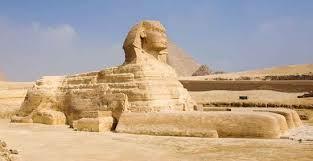 I see no sign that the ancient egyptians have used other physics unknown to us. Of course we could build pyramids! That is an easy yet huge act of stacking stones on each other, with delicate but trivial structural analysis of the center parts (hallways, chamber of the pharao). I have found no source of some sort of complicated conductors inside the pyramide, could you provide please? Ive been trying to post the pics but i use my phone and can upload and click on them to get code for post but cant work out yet cut and paste. MY BAD its costing me credibility i know thats why you'll not see any pics or links yet from me. 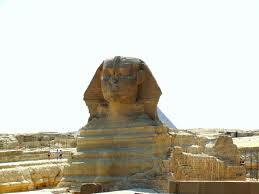 But if you google "sphinx water mark pics" you'll see what i mean instantly. In the meantime im still trying to get my act together. Sorry. nothing else than prolonged submersion coul do this. No no, no worries, I saw horizontal water marks already. But I still doubt that those are from being underwater for millions of years. And that is the lapse of time needed for continents to rise and fall (we are speaking of the Greater African Plate, thats one of the greatest continental plates on Earth). Yes, I know who he is. I was making the point that he seems to have no academic background and no connection to Egypt or Egyptology. His certainty of opinion is therefore comparable to Kim Kardashian. But he's an honorary citizen of Atlanta. Which I might add, is only a couple letters away from being Atlantis. I shall refute decades of research by meditating and making humble proclamations!